Billy was amazing!! His talent & attention to detail were top of the line. He made our wedding night truly wonderful! There guys were amazing. I don’t regret choosing these guys as our DJs. They couldn’t have done a better job. Thanks so much Jay! Much appreciated! Billy and his team were wonderful to work with. They provided a wonderful balance between live and DJ'ed music - from cocktail hour and through the rest of the reception. Billy helped work with us to make sure that the reception went as planned by helping us to finalize our agenda for the evening and then capably guiding the night as the emcee. We would highly recommend Billy and his team! Thanks so much for the kind words. Much appreciated! Billy Logue was great to work with! We had day- of location changes and he was able to accommodate us and set up music in 2 different spots for us, no problem! Also, our dance floor was filled all night long! He played all of our recommendations, and it was cool and different to have him and his son sing during dinner and cocktail hour. People loved it! Thanks so much for the very kind words. The weather wasn’t going to stop a great celebration!! Thanks for including us! When I was planning my wedding, I was torn between hiring a DJ or a band...and then I found Billy. He and his son, Ryan, provided the perfect middle ground between the two options and did an absolutely amazing job. Multiple times during our reception, my husband and I turned to each other and said “can you believe how awesome these guys are! ?” and we had multiple guests stop us during the event to rave about the amazing entertainment. In addition to being extremely talented vocalists, I felt like Ryan and Billy could literally read my mind. Prior to the wedding, Billy asked that my husband and I select a maximum of 20 “must play” songs for our reception. Of course, there were a few songs we love that didn’t make our top 20. Imagine my extreme surprise and excitement when Billy and Ryan played nearly ALL OF THEM at our wedding. It was like magic! Billy is a consummate professional who does a flawless job. Billy and Ryan were the highlight of our wedding this past May and I couldn’t recommend them more highly. Book these guys ASAP! I promise, you won’t regret it. Wow!!!! I’m definitely going to hire myself!! That was a fantastic review.....thank you so much!! It was our pleasure! If you want something a bit above a normal DJ for your wedding, Billy & Ryan are it. They sang during our cocktail reception & so many of our guests came up & commented how awesome they were. They bring an element of class to your event. A good combination of old school sophistication and current modern music. Thanks so much for the kind words Carmella. It was our pleasure. Congratulations and much happiness!! Billy Logue is very professional and great entertainment. I highly recommend them for any event. These guys were awesome! I would definitely hire again! Thanks so much Karen! It was our pleasure! My law firm has engaged Billy and his associates on several occasions for entertainment at our holiday parties. He and his team are talented, professional and very responsive. Despite a snow storm that I thought would ruin our party this year, Billy was already set up and ready to go when I arrived. What a relief! I would highly recommend Billy Logue Entertainment and will definitely be calling on them again in the future. Thanks so much Shelly. Much appreciated!! Billy and his son Ryan did all the music for my wedding and reception (Nov 2017). They are amazing! We didn't request a whole lot of songs to play and they put together a great night of music. Everyone was up dancing the whole night. Several of our guests have commented to us how impressed they were with them. So many times I looked over assuming the song playing was the original singer and they were singing! I can't say enough how great they were and what a wonderful evening it was. Thank you so much for the very kind words. Much appreciated!! Billy and Ryan were great! If you’re looking for something different for your wedding, I would highly recommend Billy. He gives you the variety of a typical wedding dj but the more personal feeling of a live band. I loved giving our wedding guests a different wedding dj experience. A few guests even came up to us during the reception to ask if they were actually singing and not just playing a recording! Billy was very easy to work with and supplied a Bridal Guide for my husband and I to fill out. I had no idea how many different opportunities there were to choose music for all aspects of our ceremony and reception. We have a very Italian family so it was important that Italian music was incorporated into our reception. Billy did not disappoint! My husband and I really couldn’t ask for a better dj experience! Wow!! Thanks so much! After reading that I'm going to hire myself!!! It was our pleasure. Billy was not available for our wedding date, but his son Ryan was and he did an amazing job! 3 weeks later and we are still getting compliments on how great he was! People have said he sings so well that they didn't even realize he was singing at times, and that they thought it was the actual song! Go with Billy and Ryan Logue, you will not be disappointed!!! Thanks again! Thanks so much for the kind words. The apple doesn't fall far from the tree!!! :-). Our best wishes to you guys!! They were fantastic! All of our wedding guests raved about the live singing and DJ options! If you are considering a DJ, they won’t let you down and the live singing was awesome! As the bride, I couldn’t be happier with my choice. We appreciate that very much. It was our pleasure!! Extremely affordable and worth every penny. It has been a few weeks since our wedding and guests are still talking about how great Billy and Ryan were. Their singing is amazing and they are great DJs as well. Couldn't be happier that we had these guys for our wedding, guests danced all night! We paid a little extra for a female vocalist, Keli, to join them and she also had a beautiful voice! Thanks Sarah!! That was very kind! It was our pleasure!! 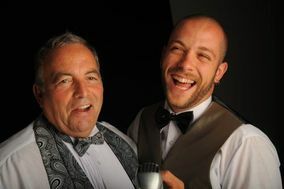 Having the Logues entertain your event is the best decision you will make. They are awesome! You guys are way too kind!! Thanks so much. It was a pleasure working with you again!! Billy Logue and his team were awesome. They were very easy to work with and did an amazing job. Their mix of live vocals and recorded music was great. Our guests were amazed that the music was live and not recorded. We have had so many compliments on these guys from our friends and family who attended. Thanks so much Lauren. It was our pleasure! Never book with anyone else! Flexible to what you want and make your day a hit! Everyone we talked to after our wedding commented on how great the DJ was. Thanks Billy! Thanks Brad....that's really kind. It was our pleasure! Hope we see each other again, and best wishes! We used Billy Logue Entertainment for my son's college graduation party at the Rockwood carriage House in Wilmington, De. We have heard from most of our party guest that Billy and his son were awesome! They provided excellent entertainment for the entire party. They sang during dinner and many of the guest could not believe how good they sounded. I would highly recommend them for any event. That was very nice!! A beautiful event with really fun people. Thanks for having us be a part of it! Appreciate the kind words!! Absolutely loved Billy Logue and would highly recommend. We had Billy and his son Ryan for our wedding reception and all of the guests have commented about how great they were. They sang during the cocktail hour and dinner portions and periodically throughout, and played music the remainder of the time. Kept the tempo going well throughout the whole reception! It was a pleasure to work with you Tommy. Thanks for including us in your celebration!! Billy and his son did a fantastic job at our wedding. They were well prepared and played the exact style music we asked for. Most of my guests did not realize until half way through dinner that they were actually singing, and that it was not a recording. That is how good they were. They had one technical difficulty, but they were able to transition through it smoothly. I would highly recommend using Billy Logue, you will not be disappointed. Thanks Brett. We really appreciate that. You were a pleasure to work with. Wishing you guys a long-lasting, loving relationship!! Billy is a fantastic DJ. He did such an amazing job at my wedding. Everyone loved hearing him sing during cocktail hour and he did such a great job playing songs that would get the crowd moving! Thanks so much for the kind words Stephanie!! Billy Logue and his son were absolutely amazing! We had a Sunday brunch wedding which is the hardest day and time to get people up and dancing. Lucky for us Billy read the crowd and played all the perfect music. The dance floor was packed all throughout the reception. I wouldn't classify them as a DJ but rather entertainers! Billy sat with my Mom and I to get everything in order before the big day. He made two really great suggestions that many people gave us compliments on. One was a dance that got everyone on the dance floor and another was called an anniversary dance. He is extremely knowledgeable about all aspects of music and what people like when they come to weddings. That was our pleasure Dana!! Thanks so much for the kind words!